Investigators believe Umar Farouk Abdulmutallab received practical lessons in terrorism in Yemen - a small country on the tip of the Arabian Peninsula. It is a desperately poor, failed state; the perfect place for al Qaeda to regroup when Islamic radicals were forced out of neighboring Saudi Arabia by a government security crackdown. They also came in from Iraq and Afghanistan, pushed out by American military operations. Reunited in Yemen, top militants banded together under the new banner of Al Qaeda in the Arabian Peninsula (AQAP) — the Yemen-based group which claimed responsibility for training and equipping Abdulmutallab. The government in Yemen doesn't seem to be fully able to get a fix on the problem and deal with it internally," Sajjan Gohel, director for international security at the London-based Asia Pacific Foundation tells CBS News. "That is a huge concern based on the fact that groups like al Qaeda in the Arabian Peninsula aren't just operating on a regional level, they have a translational nexus." CBS News correspondent Elizabeth Palmer reports that nexus includes al Qaeda cells strung out across a vast band of North Africa, along with the terrorist groups that support them by supplying guns and kidnapping victims. 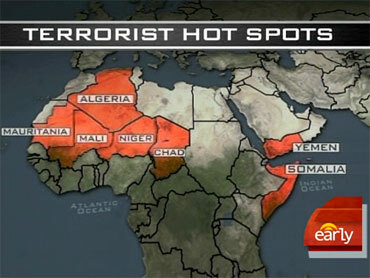 In, northern Algeria, Mauritania, parts of Mail, Niger and Chad, al Qaeda in the Maghreb is the terror group's regional franchise. AQIM emerged from Algeria's violent Islamist militant group, the Salafist Group for Preaching and Combat (GSPC). They pledged their allegiance to Osama bin Laden in 2007, and immediately declared they would be targeting Algerian, French, and American interests throughout the region. AQIM capitalized on the GSPC's long standing involvement in cross-border criminal activities across the region to expand the reach of its operations. The group enjoys the support of a network of nomad and criminal gangs that are well established in remote areas throughout the Sahara desert. To the east, just across the Gulf of Aden from Yemen, lies Somalia, yet another failed state where al Qaeda's surrogates act with perhaps the most daunting impunity. "The Horn of Africa encounters a lot of difficulties with criminality, piracy, terrorism," says Gohel. "All of those factors combined make it a very convenient place for terrorist groups to plot and plan, to recruit and train individuals." "It's a concern that you have countries like Yemen and Somalia that have terrorist groups that are recruiting internationally for activities not just at a domestic level, but at the global level… and they can plot very dangerous global plots," says Gohel. Steve Emerson, founder of the Investigative Project on Terrorism, says the Pakistan-Afghanistan border area is still the "number one" hotspot for terrorist activity, but that Yemen and Somalia are "fast coming up the ladder". "Yemen possibly could surpass Pakistan in the next year, given the terrorist trajectory for providing a haven for al Qaeda," Emerson told "Early Show" co-anchor Harry Smith. Just Wednesday, evidence of the fast-growing threat from Somalia came as police in the capital city of Mogadishu claimed Somali security forces had arrested a man carrying powder explosives before he boarded an airliner bound, eventually, for Dubai. Emerson also expressed concern over evidence showing al Qaeda is not merely migrating to Yemen and North Africa, but that young people from across the world are "actively being recruited and lured to Yemen." "There are literally scores of American Muslim students studying and being trained in Yemen to this day, still being actively trained even after the plot," Emerson claimed. "So we have to be aware of the fact that this is a continuous threat. It's not going away. There's a pool of potential terrorists out there that have Western passports that can board planes without visas."